There was a problem with the UV suit mesh which made it act as a default mesh and override one of the Maxis outfits (as well as a few of my own!). Please re-download the mesh and recolours. Yes, I know that toddlers can't actually swim. But mine like to splash in puddles. Plus, there are some cool custom objects out there, like Echo's Functional Wading Pool and rebecah's Toddler Swim Tube. I thought it would be nice if toddlers didn't have to get their clothes wet! So here are a whole bunch of bathing suits, swim trunks, and UV suits. There should be something here to suit every taste. First we have some basic swim trunks for boys. They all have Maxis characters on the left leg. This is a new mesh, which is included in the zip file. Then I thought I'd better make some swim shorts for girls. Theirs are layered over bathing suits for extra coverage. 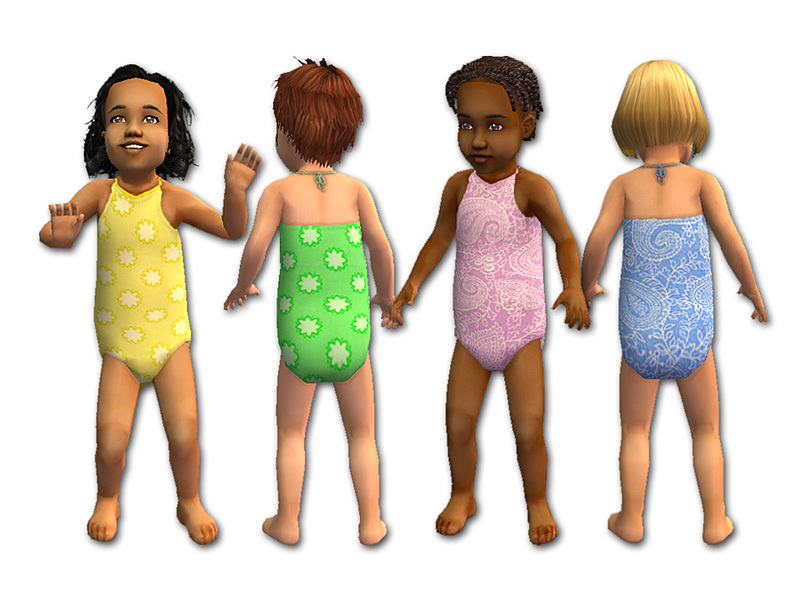 These use the same mesh as the boys' swim trunks (but a copy of the mesh is also included in the zip file). Some of my girls don't want to wear shorts, so I made them some plain bathing suits. Four are a basic tank style and have bunnies on the front. The other four are a halter style and come in two different patterns. 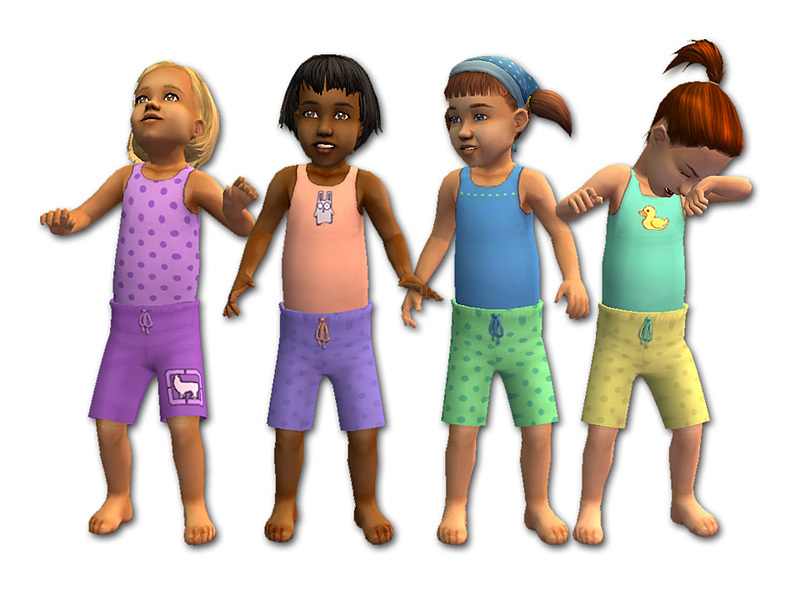 All the girls' bathing suits use the onesie mesh from my Teddies for Toddlers Collection. You must download the mesh for these to show up! And then I thought about the sun and the fact that my Sims don't have sunscreen. So I had to give them something to protect their little shoulders. There are eight colours of the UV sun suit. All are wearable by both boys and girls. This is a new mesh, and it's included in the zip file. All of the swimwear is categorized as Everyday. I thought that would be the most practical. A big thanks to melodie9, HystericalParoxysm, and fanseelamb for the cute toddler hairstyles! 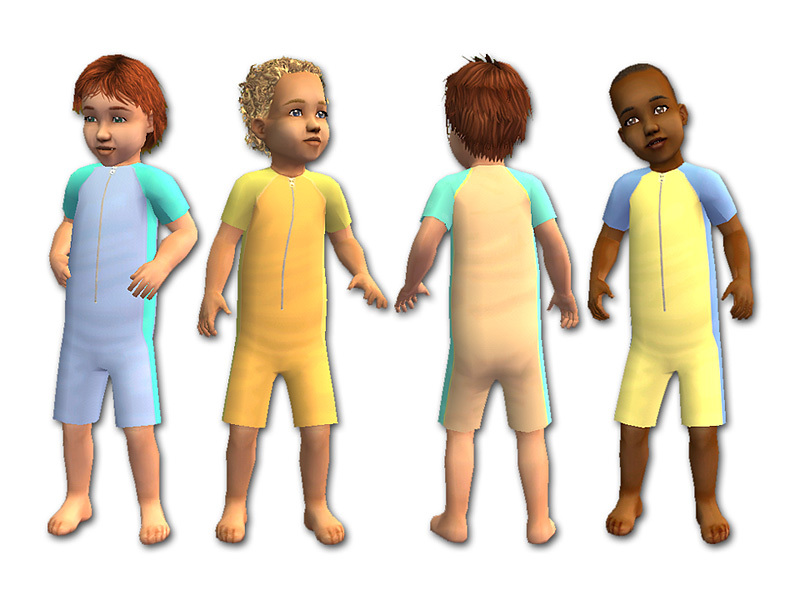 toddleruvsuits-all8colours&mesh.zip | Description: Mesh is now fixed... please re-download. Toddler Month - Swimmers for our Toddlers! These recolours may or may not be endorsed by fakepeeps7.